A trucker was dubbed a hero for driving his burning tanker loaded with fuel out of a built-up area to avert a potential explosion. 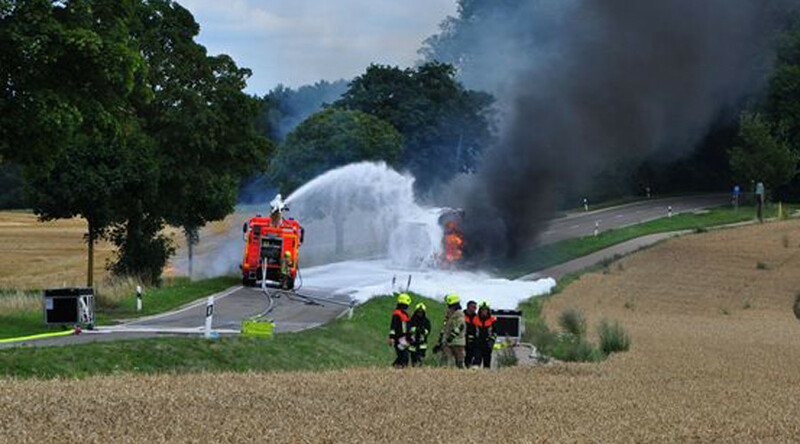 The man was driving his vehicle near the Bavarian town of Schrobenhausen in Germany on Monday when he noticed his cargo of 10,000 liters (2,650 US gallons) of petrol and 20,000 liters of diesel was on fire. After failing to extinguish the flames the man contacted emergency services and followed their directions to drive to an uninhabited area. Residents were asked to keep windows and doors closed as the truck passed through. Eyewitnesses reported the horrifying sight of the trailer smoldering and burning, according to Schrobenhausen Fire Brigade. It’s reported 100 firefighters followed the truck out of town, where they were able to eventually quell the flames. The fire is believed to have been caused by a burst tyre. Nobody was hurt in the incident.